Which countries work the shortest hours – yet still prosper? Ever dreamed of working fewer hours and still earning the same? In Sweden, it’s no idle fantasy: from state hospitals to private enterprises, office hours are being cut short in an experimental bid to boost productivity and make staff happier. A relaxed approach to doing business hasn’t interfered with Sweden’s rise to prosperity. The nation ranks ninth in an index of the most competitive nations in the world, according to a new report by the World Economic Forum, which gave Sweden a high score for employer-worker relations and efficient use of its talent pool. So which other countries are prospering despite working less than everyone else? In 2014, an OECD study found Germany to have the shortest working week in the world; a qualification that has done nothing to harm the nation’s productivity, given that it was named the world’s fourth most competitive nation, according to the Forum’s Global Competitiveness Report 2015-16. Aside from Sweden and Germany, there are two other countries that paradoxically excel in both prosperity and leisure time: the Netherlands, which comes fifth for competitiveness and yet third for the shortest working hours in the world, and Switzerland, which has been crowned the most competitive country in the world. 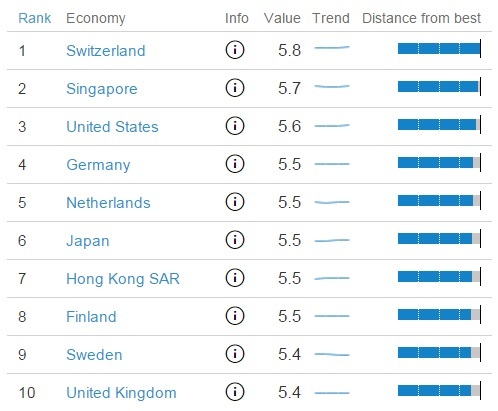 Switzerland tops the Global Competitiveness Report for the seventh year running. This is in spite of putting in a mere 1,576 office hours annually per person, which places it at number eight in the OECD’s list of countries with the shortest working weeks. The nation’s world-class levels of innovation can be attributed to, among other things, protectivenes towards employees and flexibility around working hours. Which countries work the longest hours?